The other night, I was noticing the crowds of foreign tourists in Athens. Areas between Monastiraki and Syntagma were packed, and I had to jostle through crowds on the sidewalk. The restaurants on Mitropoleos Street were packed. The Technis (Art) Theater is exhibiting objects of artistic and nostalgic value related to the institution's 75-year history at StoArt in the Korai Arcade off Syntagma Square. These include costumes, props, stage models, photographs of performances and from the backstage area, programs and newspaper reviews marking milestones in the company founded by acclaimed director Karolos Koun. Police efforts to crack down on rampant crime in places like Menidi, northwest of Athens, are indeed praiseworthy. However, there are still hundreds of reports made every day by Greeks and foreigners indicating that purse snatchers, pickpockets and all sorts of small-time crooks are the bane of many parts of downtown Athens and public transportation across the capital. A group of tourists, holding umbrellas to shield themselves from the scorching sun,w alk up the steps at Syntagma Square in Athens. A summer heat wave has hit Greece, with temperatures reaching a high of 43 degrees in the capital this weekend. The annual Athens Pride event for the LGBTQI community, celebrating equality, diversity and difference, gets under way at noon on Saturday, June 10, in Syntagma Square with body/face painting, music and dancing until the start of the parade at 6.30 p.m. The theme of this year's event is education and how perceptions can be shaped in the classroom. Natural musical landscapes and expressions of romance are the themes of this year's Athens Gardens Festival, taking place in the National Garden, just a short walk from Syntagma Square, on June 8, 9 and 10, and the Pedion tou Areos on June 11. The 5th Athens Street Pole Vault 2017 is underway at Syntagma Square in Athens. 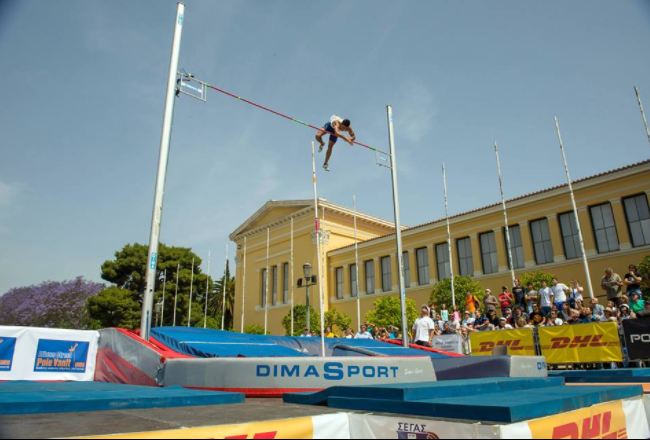 The event, organised jointly by the Greek Athletics Association (SEGAS) and the city’s municipality, saw Greek top pole vault athlete compete against each other, as well as their international fellow athletes. Informed visitors and passers-by at Syntagma Square in central Athens were treated to a rare sight on the night of April 27, as the lights went off suddenly on the Grande Bretagne side of the public plaza, and for a few minutes the hotel's facade became a huge screen for the "BedSheets" art project, an initiative conceived and realized by a young artist. The rapid rise of short-term property leasing to tourists via online platforms such as Airbnb, HomeAway, FlipKey and HouseTrip has turned the Greek property market upside down. Workers hit by lower living standards and high unemployment are expected to take part in May Day protests staged in Athens and other cities on Monday. Greece's umbrella unions, the private sector's GSEE and the public sector's ADEDY, are organizing a rally at 11 a.m. in central Athens. It will start at Klafthmonos Square and end in front of Parliament on Syntagma Square.